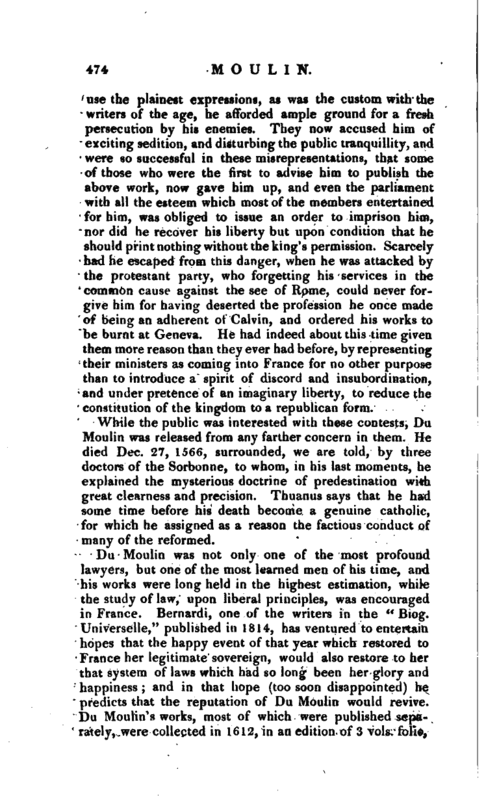 , in Latin Molinæus, a celebrated lawyer, was born at Paris in 1500. His family was noble, and Papyrius mentions “that those of the family of Moulin were related to Elizabeth queen of England;” which she acknowledged herself in 1572, when conversing with Francis duke of Montmorency, marshal of France and ambassador to England. 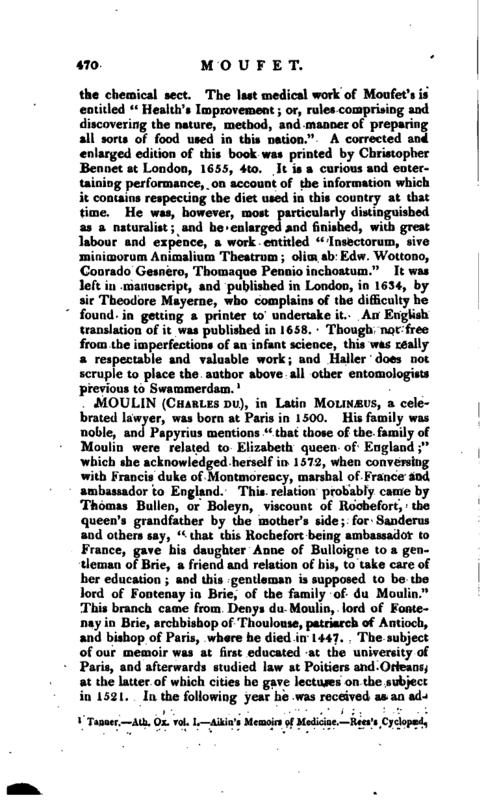 This relation probably came by Thomas Bullen, or Boleyn, viscount of Rochefort, the queen’s grandfather by the mother’s side; for Sanderus and others say, “that this Rochefort being ambassador to France, gave his daughter Anne of Bulloigne to a gentleman of Brie, a friend and relation of his, to take care of her education; and this gentleman is supposed to be the lord of Fontenay in Brie, of the family of du Moulin.” This branch came from Denys du Moulin, lord of Fontenay in Brie, archbishop of Thoulouse, patriarch of Antioch, and bishop of Paris, where he died in 1447. 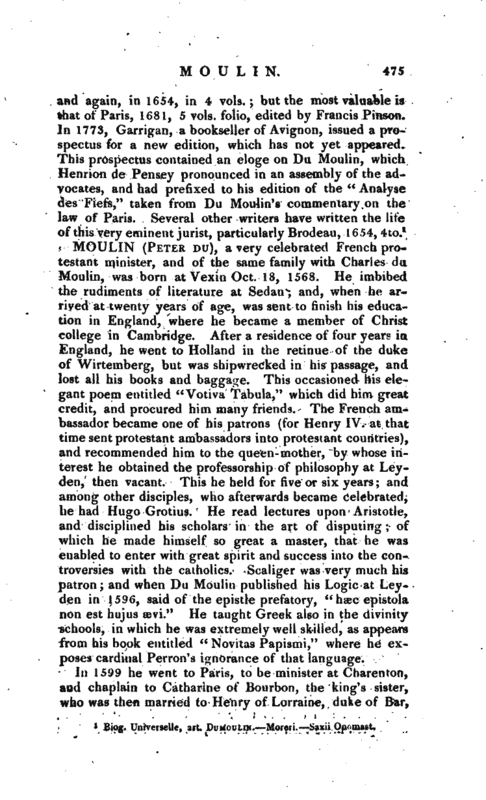 The subject of our memoir was at first educated at the university of Paris, and afterwards studied law at Poitiers and Orleans, at the latter of which cities he gave lectures on the subject in 1521. In the following year he was received as an | advocate of parliament; but, owing to a defect in his speech, was obliged to give up pleading, and confine himself to chamber practice, and the composition of those works which gained him so much reputation. He was an indefatigable student, and set such a value on time, that, contrary to the custom of his age, he had his beard close shaven, that he might not lose any precious moments in dressing it; but in his latter days he permitted it again to grow. From the same love of study, he refused some valuable employments, and even took the resolution never to marry; and that he might be equally free from every other incumbrance, he gave the whole of his property to <rn elder brother, reserving only for his maintenance the profits of his studies. It was not long, however, before he had cause to repent of this uncommon liberality, as his brother behaved to him in a brutal and unnatural way. To revenge himself, he had recourse to an expedient suggested by his professional knowledge. He married, and having children, he resumed, according to the law, the possession of that property with which he had parted so freely when a bachelor. It was in 1538 that he married Louise de Beldon, daughter of the king’s secretary, a lady of a most amiable and affectionate temper, who, instead of being an incumbrance, as he once foolishly thought, proved the great comfort of his life, and in some respect, the promoter of his studies, by her prudent care of those domestic affairs of which literary men are generally very bad managers. She was also his consolation in the many difficulties in which he soon became embroiled. He was a man of an ardent mind and warm temper, totally incapable of concealing his sentiments, particularly in the cause of truth and justice, or regard to his country. Like many other eminent men of that age, he embraced the principles of the reformed religion, first according to the system of Calvin, but afterwards he adopted that of Luther, as contained in the Augsburgh confession. On this account it is said that the Calvinists endeavoured to make him feel their resentment, and even suspended their animosity against the Roman catholics, that they might join with the latter in attacking Du Moulin. It was in 1552 that he first began to be involved in troubles, which lasted more or less during his whole life. Some years before, Henry II. had issued an edict to repress the frauds and abuses practised at Rome by the conveyancers | of benefices, to the great detriment of the ecclesiastical order; and this having occasioned a dispute between his majesty and pope Julius II. he published a new edict forbidding money to be sent to Rome on any pretence. This gave great offence to the pope, who insisted that kings had no right to pass edicts which interfered with ecclesiastical jurisdiction, and that the authority of the holy see was injured by such proceedings. Yet, says Thuanus, our kings always had such a right, and now Du Moulin maintained it with all the force of his profound legal knowledge, and produced not only arguments, but precedents for it; and in treating of the spiritual power of the pope, he traced it to foundations which were by no means of the most honourable kind. This was, in that age, a very bold attempt, and in fact so disconcerted the pope, as to make him willing to listen to the pacific overtures made by the king. It was on this occasion that the marshal de Montmorency (afterwards constable of France) introduced Du Moulin to the king, with these words, “Sire, what your majesty has not been able to do with 300,000 men, has been effected by this little man (Du Moulin was of short stature) with his little book.” The court of Rome, however, never forgot the injury: Clement VIII. ordered his works to be burnt, and they were placed in the “Index expurgatorius,” in the first class of prohibited books. In the permissions which used to be given to read certain works in the Index, those of Machiavel and the impious Du Moulin“were always excepted. 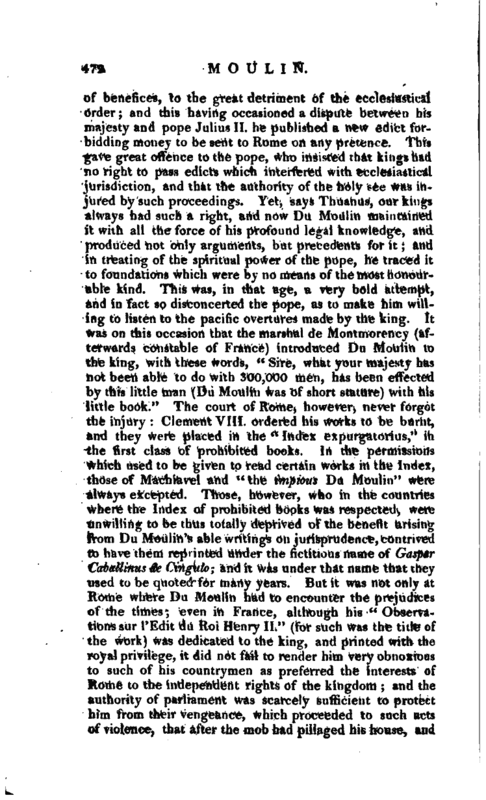 Those, however, who in the countries where the Index of prohibited books was respected, were unwilling to be thus totally deprived of the benefit arising from Du Moulin’s able writings on jurisprudence, contrived to have them reprinted under the fictitious name of Gaspar Caballinus de Cingulo; and it was under that name that they used to be quoted for many years. But it was not only at Rome where Du Moulin had to encounter the prejudices of the times; even in France, although his” Observa-f tionssur TEdit du Roi Henry II." (for such was the title of the work) was dedicated to the king, and printed with the royal privilege, it did not fail to render him very obnoxious to such of his countrymen as preferred the interests of Rome to the independent rights of the kingdom; and the authority of parliament was scarcely sufficient to protect him from their vengeance, which proceeded to such acts of violence, that after the mob had pillaged his house, and | attempted his life, he was obliged to seek an asylum in Germany, where he was very kindly received. After residing for some time at Tubingen, where people flocked from all quarters for the benefit of his advice, he was encouraged to return to Paris, but had scarcely resumed his accustomed pursuits, when the religious commotions which broke out in that city, obliged him again to leave it, after seeing his house a second time pillaged. He now retired to Orleans, and afterwards to Lyons, where his enemies procured him to be imprisoned. On being released, he returned to Paris, where new troubles awaited him. He first became obnoxious to the Jesuits, whose society was now rising into consequence, and who wanted to be permitted to establish a college for education. This was opposed by the university oY Paris, and Du Moulin supported their opposition. The Jesuits, however, backed by the ciL.nceilor Hospital, gained their point, as the parliament was induced to believe that the mode of education among the Jesuits would be an effectual check to the introduction of the new errors, i. e. the principles of the reformation. The next opportunity which Du Moulin had to give his advice, was attended with more serious consequences to him. The council of Trent had just broken up, anrl the question was, whether its proceedings should be recognized in France. The papal ambassadors, and those of the most powerful princes in Europe, were for this measure but it was opposed by the leading members of the French king’s administration, who were of opinion that it would render those civil dissentions which had been in some degree quieted, and that the council of Trent had made certain regulations contrary to the liberties and royal privileges of France, which they could by no means approve. 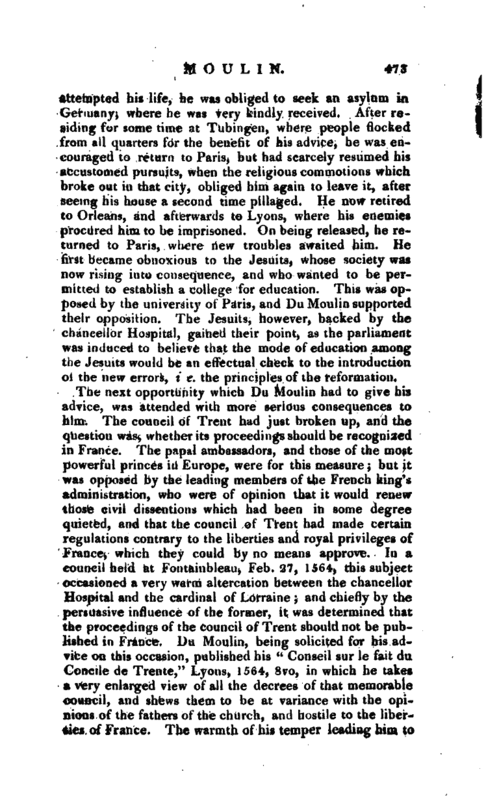 In a council held at Fontainbleau, Feb. 27, 1564-, this subject occasioned a very warm altercation between the chancellor Hospital and the cardinal of Lorraine; and chiefly by the persuasive influence of the former, it was determined that the proceedings of the council of Trent should not be published in France. Du Moulin, being solicited for his advice on this occasion, published his “Conseil sur le fait du, Concile de Trente,” Lyons, 1564, 8vo, in which he takes a very enlarged view of all the decrees of that memorable council, and shews them to be at variance with the opinions of the fathers of the church, and hostile to the liberties of France. The warmth of his temper leading him to | use the plainest expressions, as was the custom with the writers of the age, he afforded ample ground for a fresh persecution by his enemies. 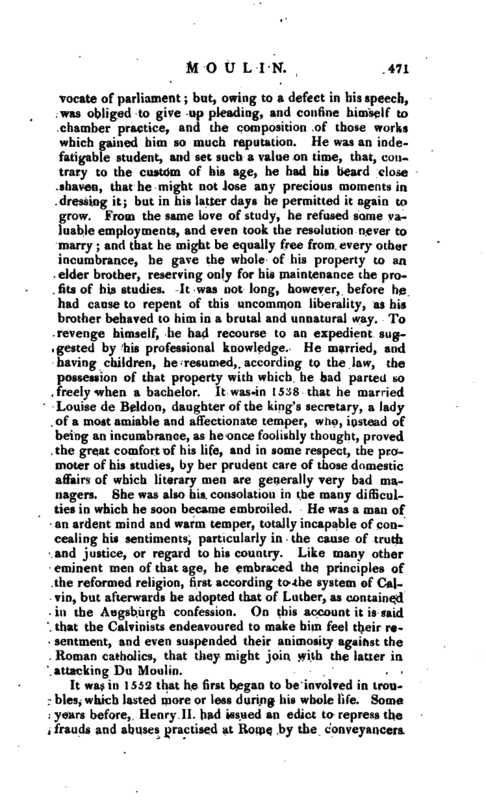 They now accused him of exciting sedition, and disturbing the public tranquillity, and were so successful in these misrepresentations, that some of those who were the first to advise him to publish the above work, now gave him up, and even the parliament with all the esteem which most of the members entertained for him, was obliged to issue an order to imprison him, nor did he recover his liberty but upon condition that he should print nothing without the king’s permission. Scarcely had he escaped from this danger, when he was attacked by the protestant party, who forgetting his services in the common cause against the see of Rome, could never forgive him for having deserted the profession he once made of being an adherent of Calvin, and ordered his works to be burnt at Geneva. He had indeed about this time given them more reason than they ever had before, by representing their ministers as coming into France for no other purpose than to introduce a spirit of discord and insubordination, and under pretence of an imaginary liberty, to reduce the constitution of the kingdom to a republican form. While the public was interested with these contests, Du Moulin was released from any farther concern in them. He died Dec. 27, 1566, surrounded, we are told, by three doctors of the Sorbonne, to whom, in his last moments, he explained the mysterious doctrine of predestination with great clearness and precision. Thuanus says that he had some time before his death become a genuine catholic, for which he assigned as a reason the factious conduct of many of the reformed.